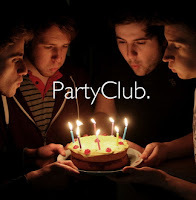 Fortunately enough after only posting one of their older songs the other day PartyClub have released a brand new single today. 'Those Girls' starts off where 'Young and Free' left off with that delightful party vibe. There is never a dull moment in the song and as the lead sings 'I put on those dancing shoes and those girls watch me as I throw my moves' that's exactly what I feel like doing. So grab your dancing shoes and get down!